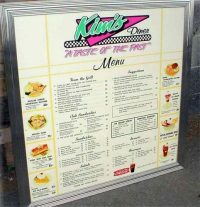 These beautiful custom menu boards are made from an original 50’s Menu – Customized with your name or the name of your “Diner Delight” – laminated and mounted to 3/16″ Gator in a custom real metal frame. Available in Single, Double or Triple variation. This beautiful custom menu board can also be made a specific size for your space requirements! Great conversation piece, and perfect “brand” for your very own home diner!